alaTest has collected and analyzed 12 reviews of Bella Dots 12-Cup Programmable Coffee Maker. The average rating for this product is 4.3/5, compared to an average rating of 4.4/5 for other products in the same category for all reviews. Reviews about the maintenance and usability are generally positive. The design and price are also appreciated. We analyzed user and expert ratings, product age and more factors. Compared to other products in the same category the Bella Dots 12-Cup Programmable Coffee Maker is awarded an overall alaScore™ of 85/100 = Very good quality. Great little coffee pot, few slight concerns. I absolutely love my Bella Dot coffee pot. It is stylish, convenient , and easy to clean. I received my orange coffeemaker today and I was extremely impressed with the quality and color. At my home we go thru a lot of coffee and coffeemakers this is a great pot and we love it thanks so much. I usually buy the cheap coffee maker, but got tired of having to buy a new one every 6 months because the warming plate don't keep the coffee hot anymore. 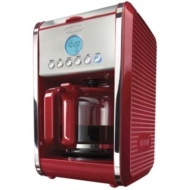 I am so pleased with this coffee maker and would recommend it and so many colors to choose from. It brightens up my kitchen. I also order the toaster. Finally got items that work.